This Post has already been read 397 times. 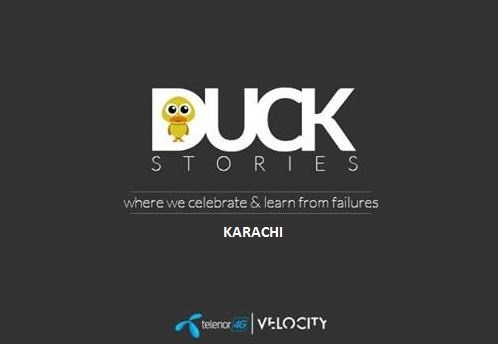 Telenor Velocity’s ‘DuckStories’ reached Karachi this Friday which brought together acclaimed innovators, industry experts, mentors, Telenor senior management and startups to celebrate and learn from their failures. DuckStories is a series of regular events where accomplished entrepreneurs and professionals share their career mistakes and failures with the audience. They share instances from their lives where they had to ‘duck’, get back on feet and tread again towards their goals. The prime objective of the program is to eradicate the fear of failure and foster experimentation to strengthen the country’s startup landscape. Speakers at the third episode of ‘DuckStories’ shared their life experiences about how they refused to be dissuaded by their career mistakes and failures in pursuit of success. Speakers included acclaimed serial entrepreneur Faizan Laghari, digital & startup specialist Haseeb Sattar and entrepreneur & MIT graduate Saba Gul. DuckStories have a characteristic fun element to them which makes the whole event both amusing and enlightening. This episode was no different where the speakers shared both laughs and sighs as they recollected their lifelong struggles. The audience expressed their utmost delight at having an event of this nature to share invaluable learning that comes from experiences. The previous two episodes of the series took place in Lahore in December 2017 and at Telenor Pakistan Headquarter ‘345’, in Islamabad, in January 2018. Both of them were equally lauded by the participants and speakers. Telenor Velocity is Telenor Pakistan’s digital accelerator program to equip and jumpstart young startups with ready to market ideas.